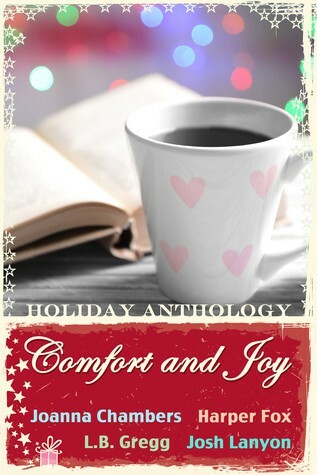 The title says it all as this enjoyable anthology focused on some established couples and some new couples as they tried to bring comfort to each other’s lives. Rest and be Thankful by Joanna Chambers (3.5 stars) An utterly depressing story about two people who are down on their luck and relatively unhappy with their lives. Cam lost his job and used his severance to open an active vacation spot which isn’t as successful as he was hoping it would be. It certainly doesn’t help that he’s not the friendliest person in town and people aren’t sending referrals his way. Rob is an artist who lost his partner and is now stuck in their house due to its negative equity. He also owns a café which was never part of his dream. An unfortunate circumstance finally brings them together around the last quarter of the story. At that point, we get a glimmer of hope and an HFN ending. Out by Harper Fox (4 Stars) Cosmo is the housekeeper-in-chief of a high-end hotel. He suffers from extreme agoraphobia and hasn’t left the hotel for over a year. Ren is a hotel guest with a bit of a mystery behind him. At one point, Cosmo is forced to leave the hotel to save Ren’s life. However, Ren really saves Cosmos’ life by being so supportive of his fears and helping him overcome them. This story was more of a mystery with some romantic elements. The majority of the story is spent learning about running a hotel. Cosmo’s character made this an enjoyable tale. Waiting for Winter by L. B. Gregg (4.5 Stars) I adored this story. Two people have really hurt each other with their stubborn behavior and poor communication skills. However, their love for each other came through loud and clear. Winter was gruff and serious while Luke was adorable and light-hearted. Winter really screwed up by thinking he could make a major decision and Luke would follow along. Instead, they spent approximately one year being too strong-willed to accept the truth that they both needed to give a little in the relationship. The story takes place while they try to figure out if they can patch things up. Baby, It’s Cold by Josh Lanyon (3.5 Stars) I wish the whole story had been more like the last quarter of it. Rocky is a chef and Jesse is a food blogger. These two best friends tried to move their relationship forward, but it didn’t work out. Now they have to determine if they should take a second shot at it. Although they spend the majority of the story together, they never really talked much until the end. The beginning of the story focused on an amateur cook making dinner, which was a bit boring. The rest of the story included a third guy, who was also in love with Rocky, and the head games that they played with each other. Once Rocky and Jesse finally talk to each other, we get some idea of why their relationship didn’t work out. Although, considering they were best friends, I’m not sure I really understood the issue, nor did I understand how they planned on fixing it. The writing was solid for all of the authors making it an enjoyable anthology. Originally reviewed for Reading Alley. Complimentary copy provided by author/publisher for an honest review. Things haven’t been going well for Cam McMorrow since he moved to Inverbechie. His business is failing, his cottage is falling apart and following his very public argument with café owner Rob Armstrong, he’s become a social outcast.